There’s only so many times I can build a train track using the same pieces over and over again. Having a 3 year old at home can be very tiring, especially if you have a son who constantly wants to be running around and being adventurous. I had heard about Hobbledown from a friend who had taken her kids before, she said it was brilliant and that we should get together and take all the kids up. So we did. Hobbledown is a truly magical place, with lots of things to do for kids and adults alike. My son loved running around and getting involved with all the activities. There is something for everyone, so if you’re a young ‘Hobbling’ (2+) or even a ‘Professor’ (65+), you can be assured that you will be kept occupied for the whole day. Trying to find something to do to keep everyone occupied can sometimes be a bit of a pain, but Hobbledown is one of the best days out with kids in Surrey I’ve ever had. Hobbledown is based on the popular book by author Angela Kecojevic. Her vision of a magical place where fantasy and reality are one has certainly been realised at Hobbledown. The farm is one of the many attractions of the site, my son loved seeing all the animals and learning all their funny names. The staff were very friendly and interactive with the kids too, some of them were even dressed up as the characters from the book. If you are looking for somewhere where you can be assured of a great day out, then look no further. Hobbledown is open rain or shine, 364 days a year. With indoor and outdoor play, there is no excuse to stay at home building train tracks. Days out with kids in Surrey have been so much easier for parents to plan since the opening of Hobbledown. You will be wanting to come back for more, and so will the kids! Hobbledown is open 10am to 6pm weekdays and 9am-8pm on the weekends. Toilets, restaurants, and disabled parking is available on site. 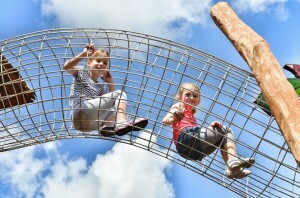 Be the first to comment on "Days out with kids in Surrey, saved by Hobbledown"